Power Free Fall...WHAT A RUSH! Historic Banning Mills is home to Georgia’s only 100 Foot Power Free Fall! Our Power Free Fall is the first of its kind not only in Georgia but on the East Coast as well. Once you zip line over to Banning Mill’s 150-foot tall Adventure Power Tower, you will climb 100 feet (ten stories) up to the Power Free Fall, where you will step off and plummet 100 feet safely to the ground. We require two people to participate in the free fall before we can open this adventure. You will receive two free falls and two additional 900 ft. zip lines that are 150 ft. over Snake Creek Gorge. The Power Free Fall is NOT a bungee jump, but a controlled fall that is very safe. Our Power Free Fall uses the Power Fan Free Fall, a High Rescue device developed by German engineers. The device allows you to descend at almost full velocity before smoothly letting you land firmly on your feet. The design of the Power Fan allows for repeated descents, with minimum maintenance required. The self-contained recall system uses DROPE instead of cable. DROPE has twice the tensile strength of wire rope of the same diameter, causing it to be five times more resistant to fatigue and is not prone to rust. The exciting 100 Foot Power Free Fall is found ONLY at Historic Banning Mills, and can be done in conjunction with the World’s Largest Zip Line Canopy Tour, the Screaming Eagle Zip Line Canopy Tours. Our facilitators are CPR, Wilderness First Responder and High Rescue Trained. We meet and exceed all ACCT & PRCA guidelines. Proceeds go to the 501c3 conservation and history center, preserving the Snake Creek Gorge by Adventure. PLEASE NOTE: Add on options can not be booked online. 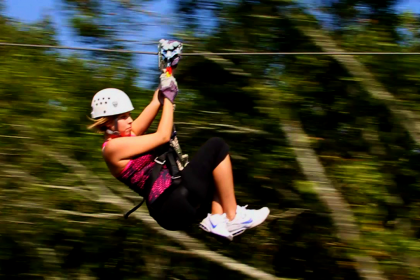 Please call 770- 834 -9149 to add to your Zip Line Canopy Tour Adventure.